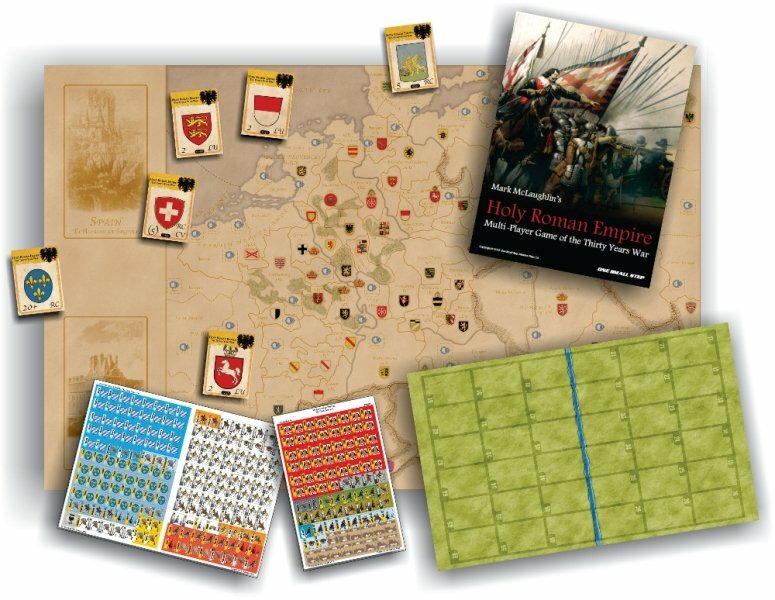 Holy Roman Empire is a political and military game of the 17th Century struggle for empire that plunged Europe into one of its longest and most destructive wars. Up to six players control the major dynasties of the era, fielding armies and navies and engaging in diplomatic intrigue and bribery to decide who will exercise control over Europe. The year is 1619. Matthias, emperor of Germany, has gone to his grave. A year-old rebellion in the imperial province of Bohemia had divided the empire along religious and political lines. Bohemian rebels have elected a minor German prince, Frederick, elector Palatine, as their king. Protestant princelings rally to Frederick, elevating his status to that of a rival to EmÂ­peror Ferdinand II, Archduke of Austria, for the imperial throne. As mercenary armies are raised against Ferdinand, the Catholic King of Spain and Duke of Bavaria rally to his side. France and Sweden turn their attention to Germany in eager anticipation of the dismemberment of their great rival, the Holy Roman Empire. The map represents the states and provinces of Central Europe in 1619. Each State is identified by its coat of arms and its name, in large type (e.g. Venice). Some of the States are divided into Provinces which are delineated by dashed lines. Many states or provinces contain one or more cities, which are represented by boxes composed of dashed lines and are identified by the city name in small type (e.g. Paris). There are also three sea zones: the Baltic, North Sea, and Channel. The map is bordered by an administrative track that is used to record the passage of turns and player. Each of the six major States have stations on the track that provide the headings (Control, Influence, or Conquer) for the stacks of cards they hold. A purple box in the lower right corner is used to indicate alliances. Each State in the game is represented by a "State Card." State cards have coats of arms symbols and a grid coordinate (first number can be found on the bottom, the second on either the right or left sides of the map using the numbers on the administrative track) to allow players to find their location on the map. All cards are coded for religion and have their income value printed at bottom left. Some cards also have special rules or allegiances indicated. 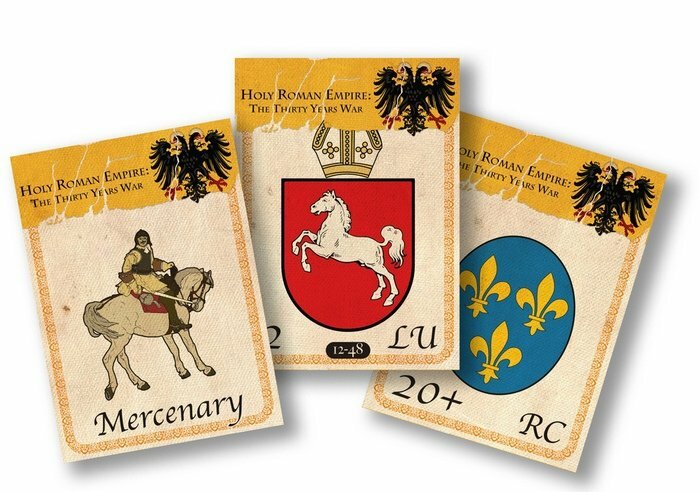 In addition, many cards have a dynastic status and are marked as the reserve, hereditary, controlled, or influenced States of a player. All other cards, unless specified by the scenario, are considered to be Independent. 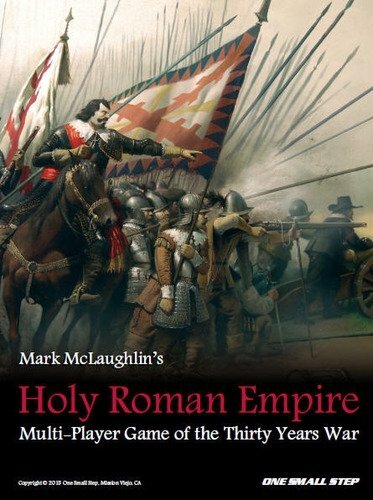 Holy Roman Empire is a game of complex economic and diplomatic interaction that includes factors such as alliances, military, economic, and diplomatic conflict, naval actions, and even the Turko-Polish war. The game is played in turns which are composed of distinct phases, at the heart of which are the Finance, Diplomatic, and Alliances phases. Players must design their turn over the course of these phases in order to be effective in the game. Once these phases are complete, the movement and combat phase occurs, the effectiveness of which will be predetermined by the previous planning conducted in turn's initial phases. The game requires considerably more diplomatic skill than it does military prowess, as the design puts players in the shoes of the national leaders (not the military commanders) who must vie for control via all the tools of statecraft. A turn begins with a random event which may inflict a likely impediment to a state's progress that is in keeping with the sorts of disasters that frequently occurred at the time, to include famines, disease, or more anthropogenic factors. 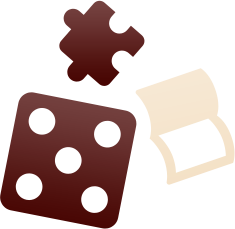 Once random events are resolved, players add up what resources remain and fill their treasuries via taxation on the realm. They must then pay the maintenance of what public goods they may have such as troops in the field, and also may then purchase additional items that may prove useful, such as mercenary leaders. 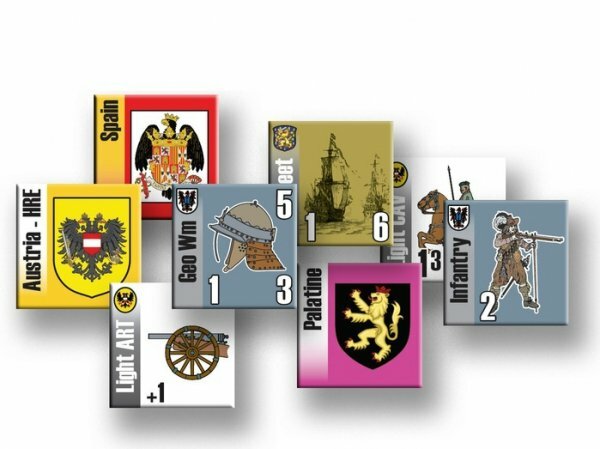 It may also prove of some utility to keep some crowns in your pocket so that you can participate meaningfully in the diplomatic bidding that is to follow, in which players will vie for influence into strategic areas. 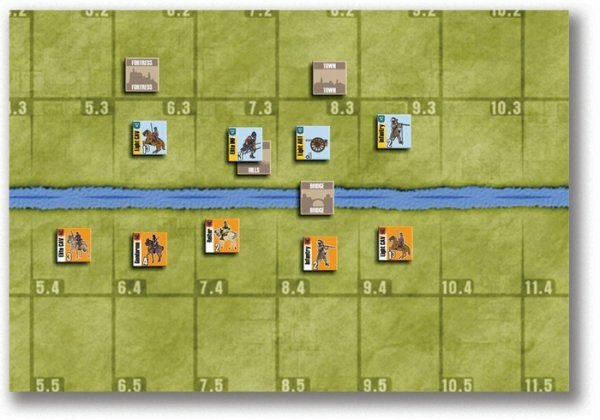 It would also be well to insure that your purchasing and strategic bidding have left you well leveraged among your potential allies, as your alliances can form your defensive bulwark, or your offensive hammer in the movement and combat that is to come.